Brandon P. Fleming’s story of struggle, success, and service has inspired tens of thousands around the world. An at-risk youth turned award-winning educator, Fleming is Assistant Debate Coach at Harvard University and Founder/CEO of the Harvard Diversity Project. Fleming was recruited to join the Harvard debate faculty at the age of 26. The college later approved Fleming’s proposal to institute the Harvard Diversity Project – an unprecedented pipeline program that the Harvard Debate Council would adopt as its subsidiary. Fleming now leads an executive staff and board that has raised over $300,000 to enroll over 50 students of color into Harvard’s international summer residency on full scholarship. The organization made history in its inaugural year after Fleming’s students dominated hundreds of young scholars from around the world. News of the achievement instantly went viral and broke national headlines, being featured on CNN’s Headline News, Huffington Post, Ebony Magazine, The Root, Blavity, Black Enterprise, and many more. 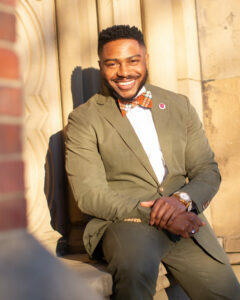 Fleming set out to establish a one-of-a-kind organization to become known for distinguishing and positioning Black youth to be pipelined into Ivy League – a radical ambition that was officially accomplished in December 2018 when his first student received Early Action admission into Harvard College Class of 2023 on a full scholarship. Fleming’s story, erudition, and achievements have enabled him to use his voice to inspire and impact lives in places ranging from federal prisons to academic institutions and global platforms such as the United Nations General Assembly. Fleming has received numerous awards for his work in education and social entrepreneurship. The Georgia Center for Nonprofits selected Fleming as a 2016 recipient of the Georgia ’30 Under 30′ award for emerging nonprofit leaders. In 2017, Fleming was inducted into Outstanding Atlanta – an annual award for 10 of Atlanta’s most accomplished leaders. In 2018, Fleming was inducted into LEAD Atlanta – Atlanta’s premier network of emerging leaders. In 2018, Fleming was also honored by Power 30 Under 30 and selected by the Atlanta Regional Commission as one of 50 community leaders to join the Regional Leadership Institute. Also, in 2018, Fleming was among the 50 world leaders selected by the Schusterman Foundation to converge in Israel for a global leadership program. Atlanta Tribune also recognized Brandon as an Atlanta Gamechanger in the 2018 edition of Who’s Who in Black Atlanta. In 2019, Fleming received an honorary resolution from the Georgia House of Representatives, as well as a community leadership recognition from the Atlanta Hawks and Crown Royal. Most notable, Fleming made history as an elected speaker for the inaugural International Day of Education at the United Nations General Assembly.